This questionnaire allows you to automatically calculate your dominant Dosha. As you can read in the about ayurveda section, your dominant dosha defines everything about who you are, from the kind of skin you may have to the way you handle awkward social situations. Select the answer that fits closest. Then click on the calculate button to find out your Dosha. I am taller (or shorter) than average and thin with a rather under-developed physique. I am average in height with a moderately developed physique. I am thick, large, broad, with a well-developed physique. I am thin, my bones tend to be prominent (knuckles, elbows, knees, facial bones, etc.) . I am heavy and easily tend towards overweight or obesity. My hair is two or more of these: Red, light brown, blond, soft, fine, prone to premature gray or balding. My hair is two or more of these: Thick, oily, wavy, medium to dark brown. Small, dry, brown and I tend to blink alot. Thin, not bushy, dry, and firm to touch. Small amounts very frequently throughout the day. Constant, can miss a meal comfortably, feels best with smaller quantities of food. I usually do more listening than speaking in new situations, but people are attracted to me nonetheless. nervous, changeable, never seems to be content. always seems to be struggling, achieving; highly self-motivated. Usually happy, slow to desire or see the need for change. Weak, I often start out very determined but later give in. Strong, if I make a decision I stay with it. I forgive and forget easily and often. It takes me a very long time to forgive; I tend to hold grudges. I understand that people make mistakes; it rarely upsets me. I have had relatively few but intensely passionate love affairs. I feel I am hungry for love and affection; longterm relationships. By analyzing the scores for Vata, Pitta, and Kapha you can determine your Ayurvedic Constitutional type. Although there are only three doshas, they can combine in ten possible ways to give ten possible Constitutional Types. Yours is indicated below. 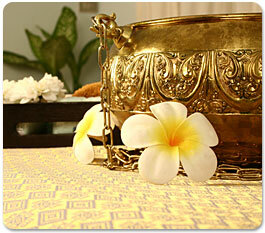 The Chiang Mai Ayurvedic Center, Thailand. Detox Packages. Ayurveda Packages. Ayurvedic herbs. Colonic Irrigation. Liver Flush. Ozone Therapy. Ion Foot spa. Far Infrared Sauna. Detox Chiang Mai. Detox Thailand.